Lady Sara first came to Earth in body as one of the Queen’s of Lemuria, planting the seeds of wisdom for God to open the portals in Earth when humanity was ready to understand why we are here. She then returned in Atlantis as a high priestess and initiator of the blue print of the Earth codes for each being. She worked in the 11th Temple where the Akashic Records alongside her beloved Master Rakoczi. Then as a daughter of Lady Magdalene & Master Jesus where she was taught healing, magic & miracles. She went to Prague where she met her twin-flame, Master Rakoczi. They met and fell in Love & married, both teaching the secrets of mystics. They had a son – Saint Germaine. Today Lady Sara is opening the Earth Star Chakra, the gateway to the Akashic Records for our future path. You can ask Lady Sara about your future. She will help you align, dissolve fear and give you direction. With her Love, plant a seed and watch it grow. Lady Sara is shown holding the Akashic records of Earth. Around her are the 6 religious orbs of light. 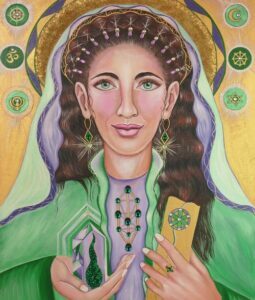 She is holding a fluorite crystal with the eternal green flame of truth and around her neck she is wearing the tree of life.